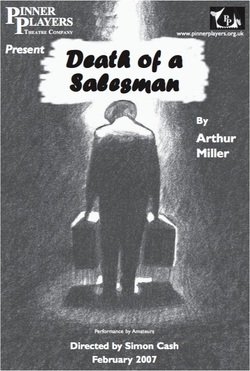 "Arthur Miller’s Death of a Salesman is considered by many to be both the playwright’s masterpiece and a cornerstone of contemporary American drama. The play was first produced in 1949 and struck an immediate, emotional chord with audiences. Much of this success is attributed to Miller’s facility in portraying the universal hopes and fears of middle-class America. Through his main character, Willy Loman, Miller examines the myth of the ‘American Dream’ and the shallow promise of happiness through material wealth. He uses Willy as an example of how undivided faith in such a dream can often yield tragic results, especially when it goes largely unfulfilled. More than a cautionary tale, however, Miller’s work is also revered for its bold realism and riveting theatricality, a play that deals in weighty emotional issues without descending to melodrama." "A salesman is got to dream boy. It comes with the territory ..."